Brazilian beach volleyball star Larissa Franca Maestrini should be used to the routine: win a tournament title, high five the fans, take the podium, accept flowers and trophies and checks, pop the champagne. If only the cork cooperated on Sunday afternoon. Larissa and teammate Talita Da Rocha Antunes struggled to free the champagne from its oversized bottle, needing a few attempts to finally celebrate their victory at the Swatch Major Series’ Fort Lauderdale Major. In front of a capacity crowd and a national television audience, Larissa and Talita beat fellow Brazilians Agatha Bednarczuk and Eduarda “Duda” Santos Lisboa in the gold medal match 21-15, 21-18. “We are so happy to know that we are doing our job in the best way,” Talita said. 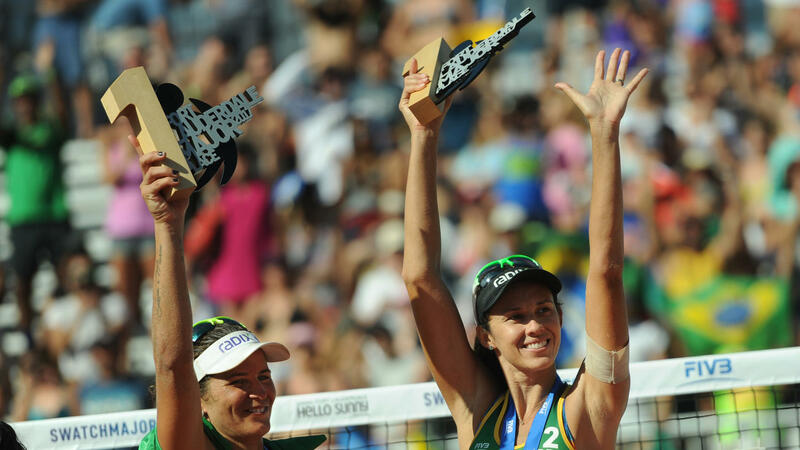 It was Larissa’s 60th FIVB championship since 2004, the most in women’s beach volleyball history. In addition to Sunday’s $40,000 prize, she has earned more than $1.8 million in her career, also the most ever.